In a connected world, the DNS perimeter has drastically expanded as global workforces now utilize multiple devices to connect to the Internet – increasing your network’s load and exposure. This expansion not only increases performance demands, but also limits your visibility into the threats that are targeting and infecting your networks, ultimately putting your organization in harm’s way. Despite safety measures and security provisions, malware still bypasses your network defenses, costing you more time and money on cleanups – as well as hindering network performance. But many of these issues can easily be prevented by simply identifying and eliminating them before your users even begin to notice them – all without the need for multiple endpoint security solutions or costly appliances. 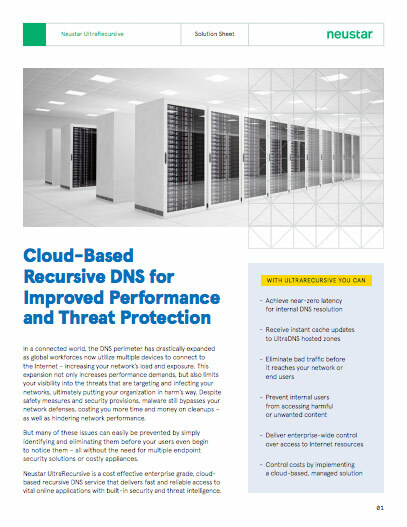 Neustar UltraRecursive is a cost effective enterprise grade, cloud-based recursive DNS service that delivers fast and reliable access to vital online applications with built-in security and threat intelligence. Stops threats at the first point of contact and blocks malware before it reaches networks or endpoints by using Neustar and third-party threat intelligence feeds. Mitigates threats by preventing access to malicious websites known for malware, phishing, spyware and bots. Blocks unwanted and inappropriate content with the use of pre-defined category based web filtering and custom white/black lists. Customize and easily enforce company-wide policies at the user level to improve productivity and ensure global workforces aren’t distracted by non-compliant sites. 24x7x365 support from a team of dedicated DNS experts.